160 pages | 5 B/W Illus. Taking a socio-cognitive approach, and integrating both theoretical and applied perspectives, the book looks at a range of contexts in which gender affects development and socialisation, from the child’s place in the family unit and their interaction with parents and siblings, to the influence of communication with peers over the internet. Throughout the chapters an age-old issue is addressed through a contemporary, empirically focused perspective – namely the nature and extent of equality between the genders, and how difficult it is for attitudes, perceptions and stereotypes to change. Key social issues are covered, including pro-social behaviour, career choice and academic competencies. Gender and Development brings together some of the latest research in this important and enduring field of study. 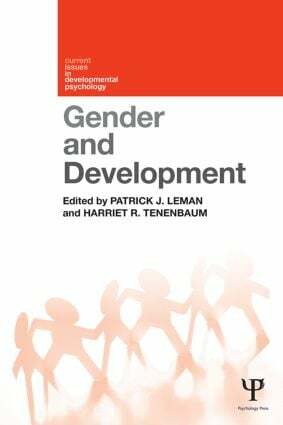 It is a timely and invaluable collection, and will be essential reading for all students and research in developmental psychology, social psychology and gender studies. 1. Leman and Tenenbaum, Introduction. 2. Harriet R. Tenenbaum and Dionna May, Gender in Parent-Child Relationships. 3. Matthew D. DiDonato, Carol Lynn Martin, & Dawn England, Gendered Interactions and Their Consequences: A Dynamical Perspective. 4. Angela Ittel, Margarita Azmitia, Jan S. Pfetsch & Christin R. Müller, Teasing, threats, and texts: Gender and the ‘dark-side’ of cyber-communication. 5. Timea Farkas and Campbell Leaper, Is Having an Older Sister or Older Brother Related to Younger Siblings’ Gender Typing? : A Meta-Analysis. 6. Benjamin Hine and Patrick Leman, The Developing Relationship Between Gender And Prosocial Behavior. 7. Andrew Scott Baron, Toni Schmader, Dario Cvencek, & Andrew N. Meltzoff , The Gendered Self-Concept: How Implicit Gender Stereotypes and Attitudes Shape Self-Definition. 8. Stefanie Sinno, Christine Schuette, Melanie Killen, Developmental Social Cognition about Gender Roles in the Family and Societal Context. Patrick J. Leman is Professor of Psychology, Royal Holloway University of London, UK. He is Chair of the British Psychological Society Developmental Psychological Section and associate editor of the British Journal of Developmental Psychology. His research explores peer communication and learning in gender and ethnic interactions. Harriet R. Tenenbaum is Reader at the University of Surrey, UK. She is the editor of the British Journal of Educational Psychology. Her research covers children’s cognitive, social, and emotional development in relationships.